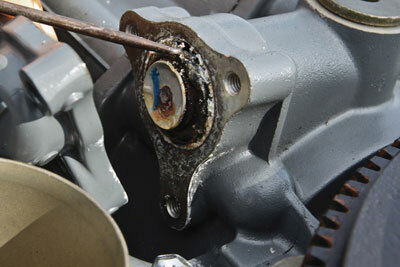 It’s no surprise that outboard engine maintenance is a hot topic. Who wants to be stranded offshore or deep in the backcountry with a mechanical issue that could have easily been avoided with only a bit of preventative maintenance? With just a little TLC and responsible practices you can keep your outboard engine(s) running reliably and smoothly for many years to come. If you’ve recently purchased a new outboard motor—for approximately the same price you could have purchased a new car—it’s in your best interest to make it last. Although pricey, the benefit of new-age outboard engines is that they offer technologically advanced designs and feature cutting-edge engineering, ensuring they will perform as expected for the term of your vessel ownership—if not longer. However, one downside to modern engineering is that the latest electronically controlled systems are quite complex and if you neglect them in any way, you may be in for an unpleasant surprise. 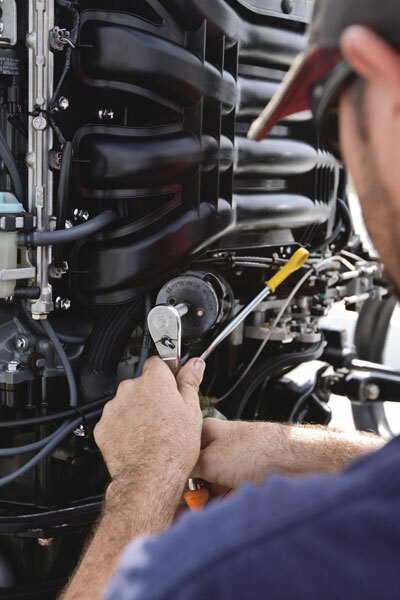 With the latest and greatest outboard engines, manufacturers have employed a wide variety of technologies and design features in an effort to improve performance and reliability, while simultaneously increasing fuel economy and lowering emissions. You can count on one thing—whether it’s an electronic fuel injected four-stroke, carbureted four-stroke, single-point fuel injected two-stroke, low pressure direct injection or high pressure direct injection two-stroke, modern outboard motors are not designed for owner maintenance. If you’re not a certified, factory trained technician, it is in your best interest to leave the tough task of performing annual service to someone with years of experience. To get the inside scoop as to what’s involved in annual outboard servicing, we contacted Mike Lund of Outboard Specialties (www.fixboat.com) in Pompano Beach. Lund tells us for many boaters around the country winterizing is a hot topic, but for those who ply their craft in the temperate, sub-tropical climate of Florida, it’s clear that the boating and fishing season never ends. With that being said, it’s still best to perform your annual maintenance during the winter season. This is due to the fact that boatyards and mechanics won’t be as busy and any issues that arise during your annual service can be handled promptly. While many boaters follow the “When it breaks, I’ll fix it” mentality, this is not a good idea and will surely reduce the reliability and efficiency of your outboard(s). According to Lund, approximately 50-percent of damaged motors that come through his shop are a result of lack of maintenance. Talk to distinguished mechanics around the state and they will likely sing you the same song. Regardless of the hours accumulated, annual service should never be neglected. Many boaters think that an annual service and 100-hour service are interchangeable terms, but this is far from the truth. 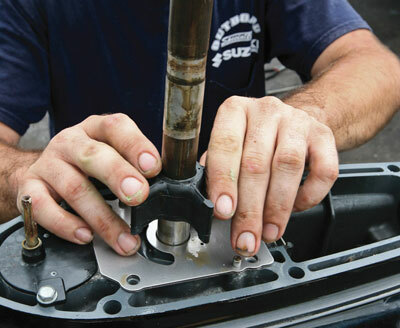 Contact your manufacturer or local mechanic and see what service plan is best for you. While you may think of yourself as handy and slightly educated in outboards, that’s fine and dandy, but professional technicians will be able to locate and troubleshoot certain components and aspects that could lead to trouble down the road if not taken care of immediately. If you’re confident in your abilities, changing your own oil will certainly cut costs when it comes to annual service, however, replacing an impeller or checking a thermostat is a different story altogether. Lets say for example your thermostat is stuck half-open. This will cause your engine to idle a bit cooler, but that’s pretty much the only warning signal you’ll receive. 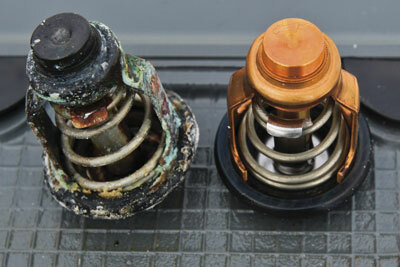 You will have no idea that your engine is running richer, effectively diminishing your outboard’s overall efficiency. Another component you may visually inspect and come to the conclusion that everything is okay is your sacrificial zinc anode. While a seasoned zinc and a brand new zinc may look the same, the used zinc will weigh significantly less and lack the integrity to perform effectively. >I do prefer to do the maintenance myself. My Honda 30HP never skipped a bit. It really takes less money and effort to do preventive maintenance than fix when something broke and your trip turns into a big headache. BTW if it helps – got me a manual and I try to keep all repairs simple. there is really nothing to it. >Hi, I was wondering if you would be interested in a guest blogger? I will gladly write a 200-300 word article about boat cleaning in exchange for a link to my boat cleaning product website. Very good points in your post. It amazes me how people will keep up on the maintenance on their car but when it comes to their boat it’s a different story. I’m certainly one who doesn’t mind getting his hands dirty, but I would always have a tech perform the end of season maintenance on my boat.